Except as provided in Title 26, United States Code (U.S.C. ), Chapter 53, Section 5844, it is generally unlawful to import a machinegun into the United States for unrestricted sale. However, machineguns that are properly destroyed may be imported. 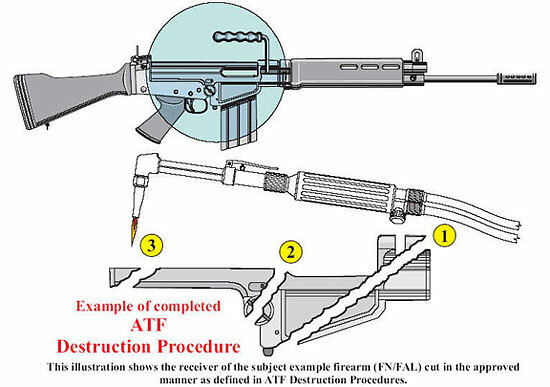 The Bureau of Alcohol, Tobacco, Firearms and Explosives (ATF) routinely receives inquiries regarding the acceptable method of destroying machineguns. Subsequent pages in this section will provide importers with several illustrations on ATF destruction procedures. 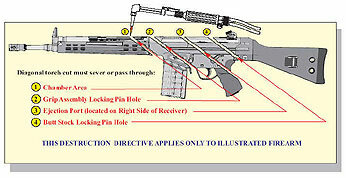 ATF Ruling 2003-1, 2003-2, 2003-3, and 2003-4 provide further guidance on the ATF approved method of destruction. Additional illustrations and guidelines for firearms not addressed in this manual can be obtained from ATF’s Firearms Technology Branch. 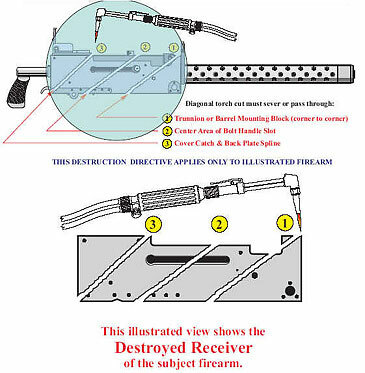 The following illustrations outline the procedures to destroy the receivers or frame of the firearm in a manner that will prevent its function and future use as a firearm. 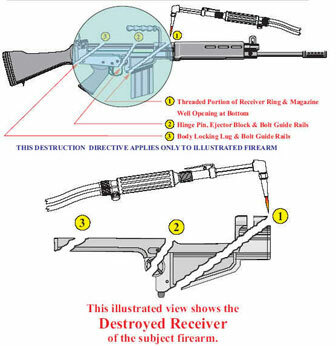 A proper method of destroying these firearms is to cut the receiver into separate pieces. The purpose of this procedure is to destroy the receiver or frame in a manner that will prevent its function and future use as a firearm. 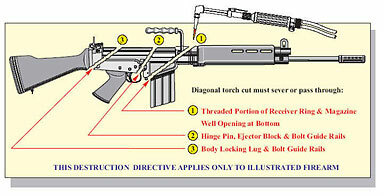 A proper method of destroying this firearm is to cut the receiver into separate pieces as follows. All cutting must be done with a cutting torch having a tip of sufficient size to displace at least ¼ inch of material at each location. Each cut must completely sever the receiver in the area indicated by the diagonal lines. 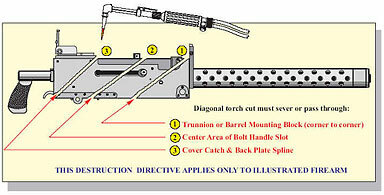 The receiver must be completely severed in each area indicated with a diagonal torch cut. Cutting by means of a band saw or cut-off wheel does not ensure destruction. 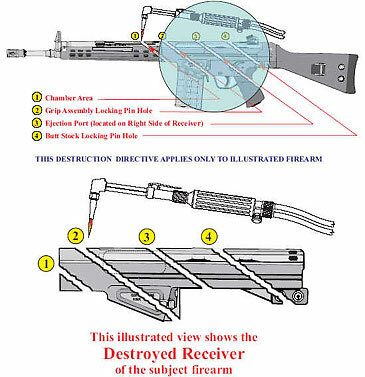 Note: Alternate methods of destruction defining the proposed procedure must be submitted in writing to the ATF Firearms Technology Branch for review and approval prior to implementation.